Last night I watched the Netflix film ‘Okja’ one of the most meaningful and heart wrenching movies I have seen in a long time. The movie is about a South Korean girl who forms a lifelong friendship with a genetically modified super pig that is bred for consumption by a big corporation. The movie is a social critique on capitalism, factory farming, and meat consumption. I know the directors intention was not to make everyone vegan but I hope it makes people question where their meat comes from so they can make more informed decisions. Anyways, the movie really struck a chord with me and I can’t stop thinking about it. I think everyone should watch it! With that said I present to you a new delicious vegetarian recipe inspired by Chinese fried rice but with quinoa. Quinoa is a super grain that is perfect for busy people who don’t have much time to put together a healthy meal. It takes 15 minutes to cook and is packed with protein, iron, and fiber. It’s a grain that I make in big batches and eat throughout the week. 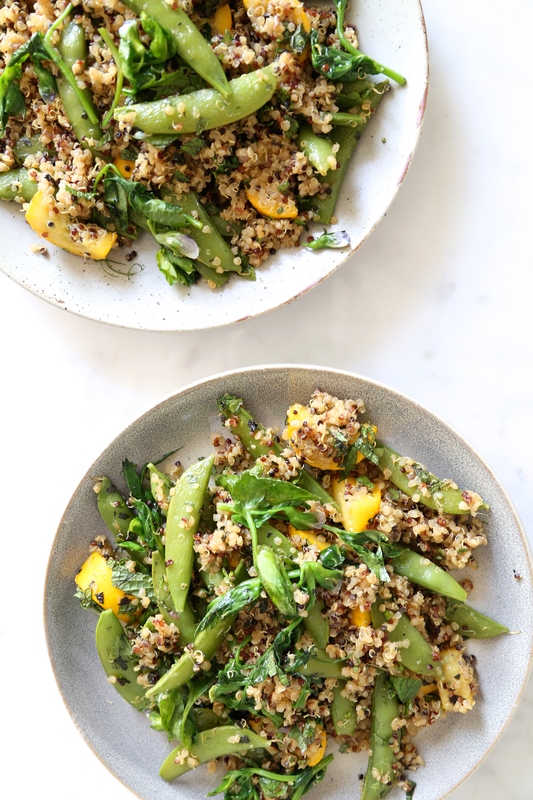 This recipe is super simple and can be made in 15 minutes using pre-cooked quinoa. If you want to add a pasture- raised egg to this recipe feel free to add it last and cook for an additional minute. Place the sugar snap peas and zucchini in a frying pan and fill with enough water to cover the vegetables. Bring to a simmer and cook until tender, about 2 minutes. Discard the water and return pan to stove. Over medium heat allow excess water to be evaporate. Add the olive oil, garlic, and ginger and cook until fragrant, about 2 minutes. Add the pea tendrils and cook for 1 minute. Add the quinoa, tamari, and sesame oil, and cook until quinoa is heated through. Remove pan from heat and mix in the mint. Serve immediately. This entry was posted in Main Dishes and tagged gluten-free, nourish, quinoa, Vegan, Vegetarian. Bookmark the permalink. Thank you for subscribing! You will receive weekly healthy recipes!